Educator Pat Deubel was concerned with the way elementary school students choose to conduct research for school projects. Fortunately, there are best practices for teachers to adopt and safe websites for learners to visit, which she shares here with THE Journal. Recently, I had a brief discussion with a third-grader who was working on a science project on American alligators. She had included several interesting facts and her own drawing of an alligator on a poster. She and her mom were proud that she had done her own research. When she said that she got her information from Wikipedia, I suggested that she might wish to include her source on the project, but she did not want to. She did not know if she would be presenting the project to her classmates. This was an authentic project, as she had selected this topic because she often sees an alligator in the waterway behind her home. But, I was concerned. What had the children learned about conducting research-based projects? Why was a third-grader using Wikipedia? Did the students have a list of safe sites to use for their research, appropriate for their grade level? Later, I easily found information about American alligators in Wikipedia using Google, as the student had done. Wikipedia articles often come up first in search engines and even might appear first when using safe search sites for kids, as I discovered using KidRex, a child-safe search tool. My concern was not just about the credibility of using Wikipedia for academic purposes. The reading level was too advanced for a typical third-grader. Researchers (Anderson, 2012) have found the overall readability of numerous Wikipedia articles too difficult for many readers. I was compelled to learn more. Other questions easily came to mind. I also sought input from the teacher via e-mail. How is the research process introduced to elementary students, particularly for using the internet? Are learners provided an age-appropriate online tutorial? 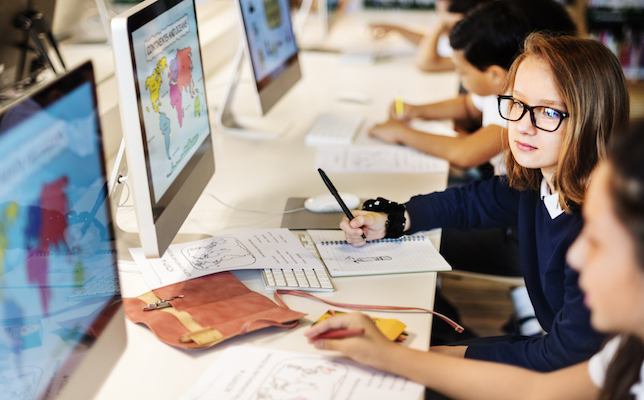 Is there a standards document indicating skills that students should be developing in elementary grades for using technology to conduct research? What guidelines/templates are students provided for developing their projects? Are they provided a checklist/rubric for how projects would be graded? How do you make parents aware that their children will be doing internet research and that their children’s “online safety” has been considered? The student just mentioned lives in Florida and formerly attended school in Texas, which is my rationale for considering those states in what follows. It may surprise some readers to learn that research-based projects can begin as early as grades K–2. Of course, the level of sophistication increases on a continuum throughout the grades. In my teaching experience, even doctoral learners have difficulty with research. Fortunately, elementary learners can hop on the Research Rocket at the online portal Kentucky Virtual Library: How to Do Research and find an interactive and engaging tutorial designed just for them. Content might also benefit classroom lessons and discussions, particularly in K–2 when students are learning to read. Some school districts develop specific resources on this topic. For example, library media specialists in the School District of New Berlin (WI) developed a series of research guides and templates, organized by grade-bands. Templates for grades 4 to 6 combine a checklist or rubric. Lankau, Parrish, Quillin and Schilling (2004) developed the Research Project Guide: A Handbook for Teachers and Studentsfor Humble Independent School District in Texas. The guide is posted on the district library website in three parts for elementary, middle school and high school research. The district also includes this resource among others it provides and uses Symbaloo, a social bookmarking tool, for this purpose. The Elementary Research Guide focuses on the Super 3 and Big 6 research models for grades K–2 and 3 to 5, respectively. Presentations on the Super 3 and Big 6 models, posted on Slideshare.net, illustrate that educators value both models. The Super 3 for K-2 includes Plan, Do, Review stages. Teachers and students are introduced to the research process, planning projects, selecting sources, taking notes, giving credit and evaluating projects. Specifically, they learn about topics, developing questions on what they’d like to know, and that information comes from books, computers and people. At the beginner level, the teacher or librarian preselects age-appropriate sources and students are provided predetermined worksheets with the plan and what they will do. They circle the source, which might include book, computer or person icons such as those found at big6.com, and review their work – checking “yes” or “no” if it was neat and if information was correct. As they progress, they learn about finding the best sources and the realm of possibilities (e.g., print, non-print, field trips, online databases). They learn about finding books using call numbers in libraries and using databases accessed from the school library site (Lankau et al., 2004). These skills are enhanced in grades 3 to 5. Students are introduced to the Big 6 information problem solving process, choosing a topic and choosing their own research product. They learn how to define a task/topic of their own and where to look for ideas. They learn information seeking strategies and how to use multiple and different print and non-print sources in their research, how to locate and access key facts in each and cite each source, and then how to synthesize the information gathered from their notes culminating in a final project format of their choice. There are multiple formats they might consider, such as completing a data chart or K-W-L chart; writing a report; developing a pamphlet, brochure or timeline; or creating a mobile, collage or picture. Their projects might involve multimedia. Software such as Kidspiration for K–5 would help them express their thinking visually using pictures, numbers, text, and spoken words. Students might have other ideas. They learn to evaluate their own work. The concept of plagiarism is introduced. They still need assistance, so templates are also available to help them complete each step in the process and to organize their research (Lankau et al., 2004). Elementary learners must have safe sites to use for research with an appropriate reading level. Districts and individual schools post subscription-based and free options on their library web pages. They provide student passwords and usernames for subscription-based options; subscribing patrons can request those. Gale’s Kids InfoBits for K–5 research. There are several free safe websites for learners. At DKfindout, as the title suggests, learners can "find out" a great deal about animals and nature, dinosaurs and prehistoric life, the earth, English, history, math, the human body, art, music, literature, science, space, sports and much more. DK’s privacy and cookies policy assures parents that it is committed to complying with the United States Children’s Online Privacy Protection Act and the UK English Data Protection Act. Kidtopia includes only websites recommended by teachers, librarians, and educational consortia. There are nine main content categories. SweetSearch, a product of Dulcinea Media, contains over 35,000 websites that have been evaluated and approved by a staff of research experts, librarians, and teachers (Learn More section). Dulcinea Media’s mission “to help educators teach students how to use the Internet effectively, safely, and responsibly” is also largely accomplished via the Web Guides it provides in findingDulcinea. Teachers might also have their favorites. The Florida teacher I contacted (name not provided to protect her privacy) recommends Microsoft’s Bing in the Classroom. However, her students also have bi-weekly media sessions in which they are shown safe sites recommended in the district’s Elementary Virtual Library (personal communication, April 30, 2017). Bing in the Classroom provides ad-free searches for K–12 schools and districts in the United States, includes enhanced privacy protections for K–12, and ensures safe searches owing to its strict filtering setting to maximize filtering out adult content (FAQ section). It also provides videos to teach students how to search, evaluate search results, and stay safe online. A school or district administrator must register to use this free service. Sometimes teachers pre-select specific resources for conducting research, which the school library posts, such as found in the fourth grade research project on Texas Indian Tribes at Timbers Elementary and the fifth grade biographical research projects at Atascocita Springs Elementary in Humble Independent School District. Per Lankau and colleagues (2004), if students wish to use sources other than those provided, the district cautions them to get recommendations from their teacher or librarian and to first learn about evaluating website content. To learn about citation methodology (e.g., MLA), younger learners might be given a template to complete with a simplified version (e.g., fill in the blanks) of information required to cite books and websites. Students should be taught to use more than one search engine, and to not necessarily rely on the first entry that comes up from their search. Even if a safe site is used there is no guarantee that the reading level of the search result is age-appropriate. For example, a search using “American alligator” on KidRex reveals Wikipedia’s entry at the top of the list. However, the same search on Kids.gov, another free option, returns a more readable, age-appropriate, top entry from the Smithsonian’s National Zoo. Educators might be interested in the tool developed to test readability of Wikipedia pages by entering the title of the page (Anderson, 2012). A table is provided at the test site to interpret results. Every good project is not only tied to a unit of study, but also to standards. Not every state endorses a particular set of technology standards. The Texas Education Agency’s technology applications curriculum (2012) is based on National Technology Standards for Students from the International Society for Technology in Education (ISTE). However, the Florida Department of Education (FDE, Instructional Technology, 2017) does not officially endorse a particular set of tech standards for teaching with technology. It does list ISTE standards as an option and has developed grade-level matrices with suggestions for instructional tools matched to many of its technology-related English Language Arts standards. For example, Google’s filtered search engine Safe Search Kids is introduced for the first time in the grade 3 matrix and is associated with Florida’s standard LAFS.3.RI.2.5: “Use text features and search tools (e.g., key words, sidebars, hyperlinks) to locate information relevant to a given topic efficiently.” Within matrices for grades 4-5, you’ll also find Study Blue for online note-taking and word processing software such as Word. Safe Search Kids also includes options for safe images, safe videos, and searches via its Safe Wiki for Kids. This latter is accomplished owing to a partnership with the KidzSearch Wiki. Much has been written on the components of project-based learning and how to conduct it, chief among those resources being from the Buck Institute for Education. Essential elements of BIE’s “gold standard” include a challenging problem or question, sustained inquiry, authenticity, student voice and choice, reflection, thoughtful critique and revision, and creating a public product. The quality of projects will be enhanced if learners are provided checklists and rubrics and receive feedback during the development process to improve their work (Lamar & Mergendoller, 2015). These help learners ensure essential elements are included and make them aware of what constitutes the highest level of attainment within criteria upon which they will be assessed. “Students can have input and (some) control over many aspects of a project, from the questions they generate, to the resources they will use to find answers to their questions, … to the products they will create. More advanced students may go even further and select the topic and nature of the project itself” (Larmer & Mergendoller, 2015, Student Voice & Choice section). Initial classroom experiences with this aspect of the “gold standard” can be an adventure in itself and a chance for learners to discover the nature of good research. From my perspective, a beginner who is learning to use the internet might do so only to locate facts for a project and might not yet be able to reach a sustained inquiry level. Starting small is fine, as the following experience of the Florida third-grade teacher illustrates. Per the teacher, a student suggested the science project noted at the beginning of this article. Most research was to be done at home. Students were only to give her the name of their animal, whether it was a vertebrate or invertebrate, and a drawing. Any other facts students wished to include were up to them. A few projects prompted a classroom conversation about information available on the internet (personal communication, April 30, 2017). This is an example of learning by doing. It provides the opportunity for all to reflect on what was learned and why certain elements, such as using trustworthy sources and providing citations, are essential. Learners who included sources would be able to easily share them with others who’d like to learn more, unlike those who did not. These latter would also have greater difficulty to prove where they got their facts. It’s also a perfect scenario to introduce the concept of plagiarism. From a teacher perspective, it’s a time to reflect on what you’d do differently the next time. For example, young learners benefit from templates to help guide them in completing research, even for projects of their choice. Such reflections and critique/feedback provide an opportunity for revision and have the potential to move students toward achieving the highest level of BIE’s gold standard, presenting their projects publicly to people beyond those in their classroom. This adds to the “real-world” relevance of their efforts. Of course, learners will “need to be well prepared to make their work public” (Larmer & Mergendoller, 2015). Depending on the nature of the project, online presentation tools such as Prezi, Powerpoint, and Google Slides might enhance a presentation and are among suggested tools within Florida’s aforementioned technology matrices for grades 3-5. Google Slides is one of several free productivity tools for classroom collaboration offered within Google’s G Suite for Education. There are numerous online tools to assist educators in introducing research-based projects to elementary learners. However, I found an inconsistency among elementary school library web pages within the same district in terms of the research tools available to learners. I’d recommend including the same core subscription-based resources and the same core safe search sites for learners. Not all school libraries I examined made an evident link to the district library or included a menu option for “Research Tools/Guides.” Ensuring these latter would greatly enhance introducing learners to research-based projects. I’d also recommend reviewing web page content in general. My investigation revealed links to resources that are no longer available. I also found some schools that posted passwords and usernames to subscription-based sources directly on their library pages, while others clearly stated to request those from the librarian or classroom teacher. Parents should be alerted when their children will need to use the internet for research at home. BIE provides a sample template with a letter to parents, which can be modified for this purpose. Teachers might mention if students will be presenting projects to an audience that also includes parents, and if projects will be displayed in the school. It’s a motivational element for learners, as well. Parents should also know where to find the list of “safe” sites provided to help them monitor work at home, if they so wish. They would need to know the username and password for subscription-based sites. They need assurance that every effort has been made to ensure their children’s online safety, including security and protection of any data collected by sites students might be using. According to results of a 2016 large-scale survey and interview study from the Electronic Frontier Foundation (Alim, Cardozo, Gebhart, Gullo, & Kalia, 2017), there is a real concern that educational technology services are often collecting far more information on students than is necessary, often without their or their families knowledge or consent, and storing it indefinitely (p. 5). Parents and educators who examine terms of service and/or privacy policies from providers will benefit from the list of “red flags” (section 3) included in the Parent Toolkit for Student Privacy, developed by the Parent Coalition for Student Privacy and Campaign for a Commercial-Free Childhood (2017). On a positive note, individual schools and districts have empowered their educators to take a leadership role in developing resources for research-based projects. The role of school librarians is not dead, contrary what some might believe. The library is no longer just about the books it contains. Librarians take an active role in teaching students and staff about media, research and online safety. Individual teachers are indeed becoming “guides on the side.” By permitting learners to choose their projects and guiding them along the way to their completion, they are enabling learners to personalize their learning and build life-long skills. We know that if elementary learners are introduced to using the internet only for collecting facts, those facts will easily be forgotten when the activity is over. But, those facts will become memorable when students use those facts to create an actual project with meaning to them — “kudos” to these educators.